The use of composite material to reduce the structural weight has earned an increase of importance to the maritime sector. A reduction in weight can lead to several synergy effects such as lower operational costs, improved stability properties and greater cargo capacity. On the other hand, composites are vulnerable to fire. The material is combustible and will lose its load-carrying capacity at the early stage of a fire compared with steel. To cope with this, technical solutions for reducing this vulnerability are imperative. This is one of the objectives in a recent research project, Convince, in which SSPA has been a partner. The Convince project is a military research project, financed by the European Defence Agency, EDA. It started in 2007 and is still running. The project involves several companies and research institutes from six countries with the aim of finding vulnerability reduction technologies for large maritime composite structures. The participants have done a lot of work and this article does not intend to reflect the whole project, only highlight some of the areas where SSPA was involved. The participating countries have different focuses. Sweden and Norway are looking at vulnerability reduction technology for a fully composite naval ship, whereas some of the others are focusing on a composite superstructure on a hull made of steel. The general approach is divided into two work packages after the primary and secondary weapon effects: blast and fire. Although this is a military project, several of the outcomes are also valid for non-military applications. Normally, large naval ships are made of steel. Some of the benefits with steel are the fact that it is not combustible and that it is weldable. The advantage with non-combustible materials when it comes to limiting a fire is obvious and a well-crafted weld between, for example, a bulkhead and a deck, can be as strong as the base material. A fully composite ship must have sufficient overall fire safety, even if the material it’s made from is combustible. To cope with this, an overall risk based assessment must be done to show equivalent safety. To limit damage longitudinally in a ship in the event of an internal blast, the bulkheads must be strong. Of course the joint between the bulkhead and the deck also needs to resist the forces involved. In a steel ship this joint is simply welded with sufficient strength. In a composite ship however, a traditional composite joint between a bulkhead and a deck is relatively weak and another solution for the joint is needed if the bulkhead is to be blast resistant. Use of internal structure instead of fire-stiffeners. In the case of a fire in a compartment of a composite ship there is a major risk that the bulkhead loses its load-carrying capacity due to the high temperature. Therefore these bulkheads are usually fitted with special reinforcements. The reinforcements have usually been composite beams glued or laminated on to the bulkhead, known as fire-stiffeners. Using these reinforcements the time before collapse is increased. However, in the Convince project some of the bulkheads need to be blast resistant as well. To withstand the load from a blast, the bulkhead is designed to allow very large deformation to carry the blast pressure load as a membrane. It is probably more complicated to design reinforcements that will allow this large deformation and still remain attached to the bulkhead after an internal blast. Therefore another approach to achieve the required fire protection is suggested by SSPA. Do not look at the damaged bulkhead alone. Develop a global ship FEM model to show what happens with both global and local strength in the case of damage due to a fire in one or more compartments. If necessary, use interior structural members near the damaged bulkhead to prevent the deck collapsing. 1. Determine speed requirements after the damage has occurred e.g. five knots in a rough sea. 2. Make a strip-calculation to get the global bending moment and the global shear force for the reduced speed. 3. Determine the deck loads, either actual or from the classification society. 4. Decide the extent of the damage caused by the fire and which bulkheads and decks that don’t carry load anymore. 5. Apply global bending, global shearing and deck loads to the damaged ship model. 6. Evaluate both the global ship strength and behaviour of the decks in adjacent compart ments near the damage. 7. If necessary use interior structures e.g. interior bulkheads, or pillars, to allow the deck to still carry its deck load. 8. Extend or move the damage in the ship and repeat pt. 5 to 7 until requirements are met. 9. Let the above analysis serve as input when designing the ship’s general arrangement. The described method can also be used for other types of damage. It takes time to create a global ship FEM-model and therefore it is wise to use it for other structural members as well, e.g. 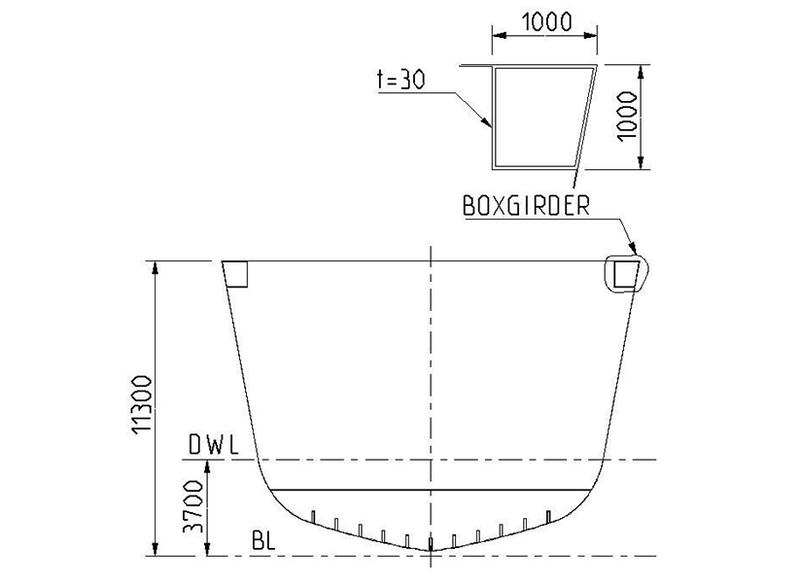 a boxgirder. Global ship FEM-model showing first buckling mode where the boxgirder has started to buckle. When a ship is operated at sea it is exposed to wave loads. These wave loads create global bending moments in hogging and sagging. The size of these moments depends, among other things, on the sea-state and ship speed. The purpose of the box girder is to maintain enough global hull strength after an internal explosion or similar damage so that the ship can safely return to port in a damaged condition, at a reduced speed. The concept with box girders is not new. Box girders were investigated in a Swedish project in 2004 and have also been studied and implemented on steel ships by other navies. 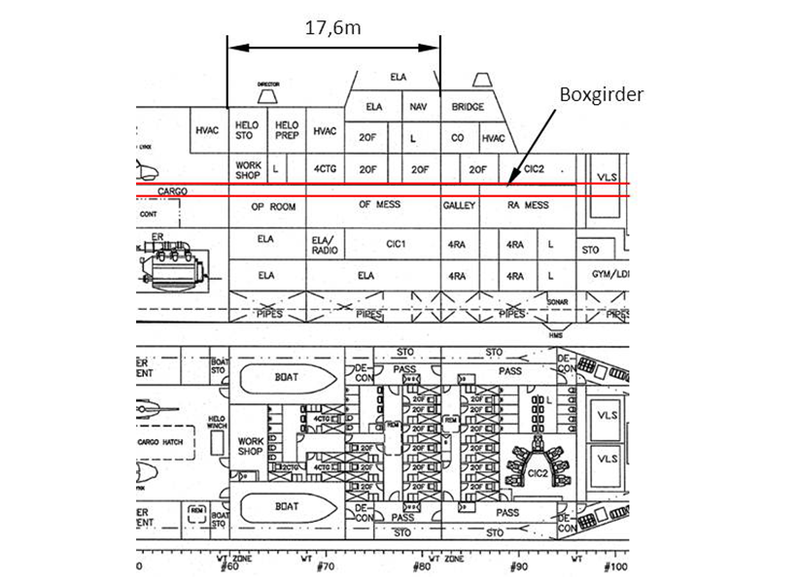 Example of buckling length of box girder, applied to the reference ship, a 100 m multi-purpose frigate. Usually global bending moments are taken from classification society rules that in some cases are independent of the ship’s speed. Thus it can also be larger than the real global hull moments for the reduced speed. To enable a less conservative design, a prediction of the real moments for the reduced speed has been made based on strip-theory. This method takes speed and motion into account and results in a more realistic input for dimensioning the box girder. In this particular case, the boxgirder should be designed for five knots in sea state 7, corresponding to the conditions in the North Atlantic. The result of the strip calculations showed global bending moments which was in the magnitude of half the moments stated by the classification rules. It is therefore well worth implementing the strip-theory to find more realistic dimensions of the box girders and avoid over-dimensioning. The global bending moment causes alternate tensile and compressive stresses at the deck level where the box girders are placed. In this particular case, it was the buckling behaviour of the box girder when it was exposed to the compressive stress that was the dimensioning factor. Two-compartment damage with a buckling length of 17.6 m was assumed for our reference ship. Example of midsection with boxgirders. 1. Determine the speed requirements after the damage occurs. 2. Do a strip-calculation to find out the global bending moment for the reduced speed. 3. Design your midsection for full speed according to the classification society for an undamaged ship, including a first assumption of the boxgirder’s dimensions. 4. Decide the extension of the damage in the cross-section/transverse direction of the ship. 5. 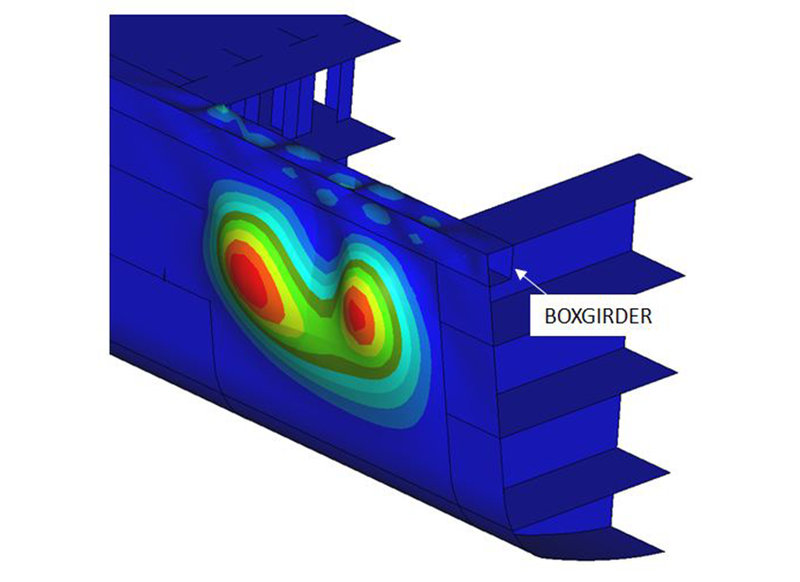 Calculate the cross section properties for the damaged cross section and use it to determine the longitudinal load impacting the boxgirder. 6. Decide the extension of the damage in the longitudinal direction of the ship. Use this length as the buckling length for the boxgirder. 7. Check the buckling behaviour of the boxgirder with the above longitudinal load and buckling length. 8. If necessary go back to step 3 for another iteration using new dimensions for the boxgirder. Note: Alternatively, if you have a global ship FEM-model, the box girder can be designed using a similar method described above under the heading “Residual strength after fire”. When designing ships in non-conventional material, special focus must be on the added risks. The total risk profile is usually complicated and must be balanced with the ship’s properties (e.g. a lighter ship) and costs. In this article two fairly straightforward methods to cope with residual strength after damage are shown. By combining modern tools such as FEM and Linear strip theory it is possible to suggest technical solutions that are sufficiently safe without being over-dimensioned. The methods can also be applied to a passenger or container ship. At SSPA we have the knowledge and tools to guide you from risk to blueprint. The Finite Element Method (FEM) is a numeric method used for solving complex problems in structural mechanics but is also used in fluid dynamics, thermodynamics, and other areas. The survivability of a warship is its ability to remain operational in a hostile environment. It is the protector of both life and property, yet it is often a low-prioritised aspect of the design. It can be an attribute fitted on an existing vessel, but the most efficient solutions are integrated in the early stages of design. The entire series of five ships have been delivered to and accepted into full service. During the project SSPA has supported with expertise and consultancy services in a number of technical areas.